Unlike the competition, Sno-Way’s patented wireless Pro Control™ plow control offers the ultimate in-cab flexibility. 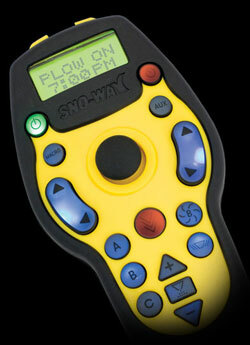 The Sno-Way wireless control can be mounted virtually anywhere in the cab and is simple to operate with either hand. In addition, the wireless Pro Control™ eliminates cumbersome dash wires that can easily become tangled or restrict placement of the control – especially for left hand use. The wireless Pro Control™ keeps your truck cab in original condition and installs in minutes with ZERO drilling or wire harness “snaking” through the vehicle firewall. A wired version is also available.